The GT-1 from GLP is a true hybrid fixture, working as a Spot, Beam and Wash fixture with highest levels of performance. Using a high powered 440 Watt discharge lamp, its high quality optical system produces a light beam that features an enormous 22:1 ratio zoom range from 3.5° to 57°. The GT-1 incorporates an optical design that doesn’t require different ‘modes’ to activate and so all feature functionality is available at any time. When in spot mode, the GT-1 offers a wide range of effects, including CMY color mixing, eight rotating gobos, 14 fixed pattern gobos, additional beam reduction gobos, and a variable speed animation wheel that can be repositioned within the beam. But it doesn’t stop there, the GT-1 also features three different rotating prisms, and a fixed color wheel with color correction filters, further widening the color pallet. When in beam mode, the GT-1 produces an astonishing highly near parallel beam of light at 3.5° through its large 145mm diameter front lens, which remains bright and consistent over long distances. As there is no physical changes, full functionality remains in the GT-1 whilst producing these incredible beam effects. In Wash mode, the GT-1 produces a soft edged beam from a variable filter that can be inserted into the beam to give the desired level of wash that you wish. 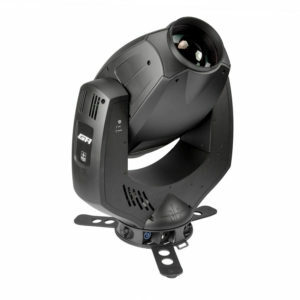 The GLP GT-1 features their unique baseless design, full 16 bit pan and tilt movement, full range dimming and shuttering capability, an in built battery for fixture setup, an auto sensing power supply and a low weight of just 55 lbs., in all giving a vastly versatile fixture for a wide range of applications.